David T.W. Chiu, M.D., F.A.C.S., F.A.A.P. By Hsueh Hwa Wang, M.D. Best Doctors in New York, America’s Top Doctor in Hand Surgery, Microsurgery, Cosmetic Surgery (face), Peripheral Nerve Surgery, Who’s Who in America and Who’s Who in the World. 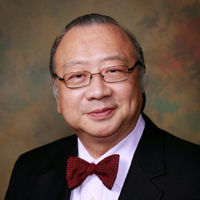 He also served as President of American Society of Reconstructive Microsurgery, American Society of Peripheral Nerves, New York Regional Society of Reconstructive Plastic Surgery, New York Society for Surgery of the Hand, President of The Sunderland Society (the most elite group of peripheral nerve surgeons of the world) and currently he is the Founding Chairman of the world Association of Plastic surgeons of Chinese Descent. Dr. Chiu was very keen on the health status of Chinese Americans and the professional development of Chinese American physicians. Such expressed interest and his natural leadership ability led to his recruitment to the Board of the then American Chinese Medical Society in 1984. In 1986 he was elected President of the Society. He immediately proceeded to re-organize, redirect, and reinvigorate the Society. He changed the name of the Society from American Chinese Medical Society to Chinese American Medical Society. It was based on the vision that while we are Chinese by race we are American by citizenship. While we should live up to our responsibility, we must assert our rights as Americans. Chinese American physicians, working cohesively together, could make significant contribution to American medicine and “will stand as a magnificent column in the house of American Medicine”. To honor the founding member and past presidents of the society, he formed the Board of Regents. To bring in new blood he recruited a whole new generation of Chinese American graduates from American Medical Schools. To grow horizontally he organized two additional chapters, the Northwest Chapter and the Mid-Atlantic Chapter. To capitalize the society coffer, he raised the membership dues from 20 to 100 dollars. To substantiate the scholarship fund he initiated a fund raising dinner program including the Chinese New Year Banquet. To democratize the governance he created a Council inclusive of not only members of the Board of Directors but also members of all Committees. To make the presidency more effective, he lengthened the term of the presidency from one to two years. To ensure continuity he created the position of Executive Director; he even managed to convince me to accept the appointment which I have been stuck with for the next 25 years! His haute vision, his dedication, his energy and his demands for nothing but the best fundamentally changed the course and outlook of the Society. One poignant moment was the night when he host he Third Health Conference (of FCMS) on Problems related to Chinese in America at the fabled Window on the World. The two hundred strong of Guests and member of CAMS entered the top floor of the WTC in amazement, left with hope and pride. For his outstanding contributions, he was elected President Emeritus of CAMS and an ex officio member of the Board of Directors, a role he continue to play exemplarily. Moreover, he was also the prime founder of the establishment of the Federation of Chinese American and Chinese Canadian Medical Societies (FCMS) in 1994, and later the FCMS Foundation dedicated to supporting the mission of FCMS. He currently leads the FCMS Foundation as its founding President. Copyright © 2016 Federation of Chinese American and Chinese Canadian Medical Societies. All rights reserved.